Actemra is an immunosuppressive biologic drug used to treat autoimmune conditions like rheumatoid arthritis. It is available as an infusion or an injection. The medicine works by suppressing the immune system, so it may cause serious, life-threatening infections. Actemra is a biologic drug that changes the way the immune system works. Its active ingredient is tocilizumab. The drug’s main use is to treat rheumatoid arthritis, an autoimmune disease that causes the body’s immune system to attack the joints. But the medication can also be used to treat other autoimmune conditions. It comes as intravenous infusions and/or subcutaneous injections in single-dose prefilled syringes or autoinjectors, depending on the condition it’s treating. Actemra is an immunosuppressive biologic therapy. It reduces the overall activity or effectiveness of the immune system. The U.S. Food and Drug Administration first approved the drug in 2010. Genentech, a subsidiary of Roche, makes the medication. In its October 2018 Investor Update, Roche reported the drug had brought in the equivalent to nearly $1.6 billion worldwide in the first nine months of 2018. The United States was the drug’s biggest market, and Americans spent about $620 million on tocilizumab prescriptions. The FDA approved tocilizumab for adults who have moderate to severe rheumatoid arthritis and have tried one or more Disease Modifying Anti-Rheumatic Drugs (DMARDs) without success. The FDA expanded the drug’s uses to include treatment of patients who are 2 years old or older and have active systemic juvenile idiopathic arthritis, a chronic inflammatory joint disease that affects children who are under 16 years old. The FDA added polyarticular juvenile idiopathic arthritis treatment to the list of approved uses but limited the use to patients who are 2 years old or older. This type of arthritis affects five or more joints in children under 16 years old. 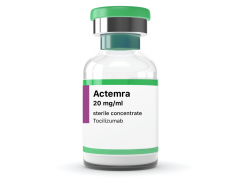 The FDA approved tocilizumab to treat adults who have giant cell arteritis, a severe inflammatory disease of blood vessels that mostly affects people who are over 50 years old. The FDA again expanded the drug’s uses, this time to include severe or life-threatening cytokine release syndrome caused by chimeric antigen receptor (CAR) T cell therapy, an immunotherapy designed for the treatment of certain cancers. 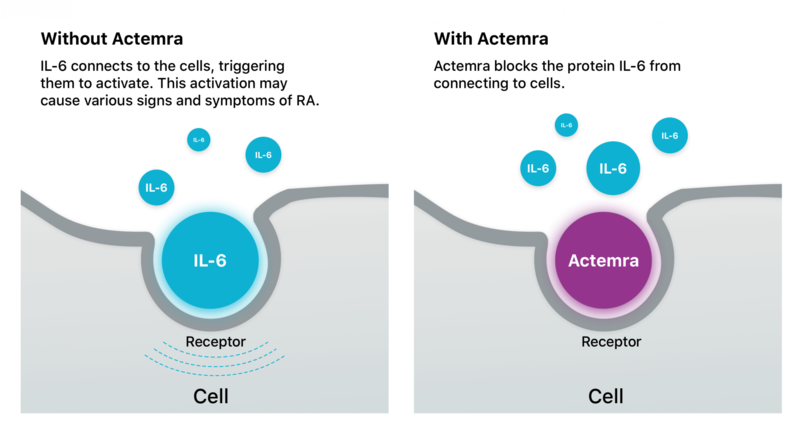 Actemra works by blocking the action of a certain protein in the body called interleukin 6 (IL-6). IL-6 acts as both a pro-inflammatory and anti-inflammatory. It’s said to have a role in rheumatoid arthritis and its effects. IL-6 connects to the body’s immune cells and triggers them to activate, which may cause various signs and symptoms of RA. 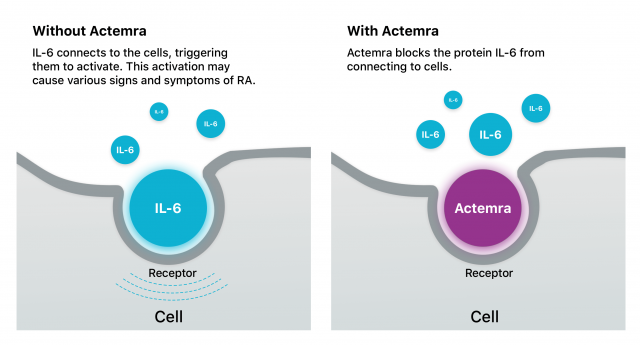 Tocilizumab is the first RA drug to block IL-6 from connecting to cells. Patients can receive the medication via two different methods: subcutaneous injection or intravenous (IV) infusion. Subcutaneous injection is an injection under the skin. The medication comes in a single-use, prefilled syringe or in a single-use, prefilled autoinjector called ACTPen. The FDA approved the pen in November 2018. Patients can inject themselves at home, or a caregiver or health care professional can do it for them. The recommended sites for self-injection are the front of the thigh or the abdomen except for the 2-inch area around the belly button. For each new injection, choose a different injection site that’s at least 1 inch from the last area where you injected the medicine. When it’s time for your injection, take the medication out of the refrigerator and let the pre-filled syringe or pen reach room temperature before you inject it. If you skip this step, the injection may feel uncomfortable or you may have trouble pushing the plunger in. Patients receive the IV form at a health care provider’s office or other medical center. A medical professional administers the liquid solution into the vein with a needle. This type of infusion takes about one hour. Dosing depends on a person’s weight, how the drug is given and the condition it’s treating. Other factors can also influence the recommended dosage. These include any pre-existing health conditions and whether the patient takes other medications. Actemra side effects can be mild or severe. Common side effects include upper respiratory tract infections, headache, increased blood pressure and reactions at the injection site. The drug has a black box warning — the FDA’s most serious warning — for the risk of serious infections that may lead to hospitalization or death. These include tuberculosis, invasive fungal infections, viral infections and bacterial infections. People who take tocilizumab with methotrexate or corticosteroids are most at risk. “Actemra changes the way your immune system works. This can make you more likely to get infections or make any current infection worse. Some people have died from these infections,” according to the Actemra website. In addition, people who have taken the drug have suffered stomach tears, changes in blood test results and reactivation of a dormant hepatitis B virus. Though rare, some patients may suffer multiple sclerosis, and the drug can increase your risk of certain cancers, according to the drug’s website. The FDA has also received reports of serious or deadly side effects that are not listed on the drug’s label. Reported issues include heart failure, heart attack and stroke. Some patients should not take Actemra, so it’s important to talk with your doctor about your medical history before you start taking the drug. Women should also let their doctors know if they are pregnant or plan to become pregnant. Animal data suggests the drug may cause harm to unborn babies, but studies of the drug in pregnant women are too limited to determine whether the drug can cause birth defects and miscarriages in humans. A pregnancy exposure registry monitors pregnancy outcomes in women who take the drug while they are pregnant. Genentech encourages physicians and pregnant women to register. The company advises against taking the drug and breastfeeding. Before starting tocilizumab, provide your doctor with a list of all other substances you use. This includes medications, supplements and alcohol. Using Actemra with other drugs or substances can change the way the drug works in the body. Drug interactions can increase or decrease the effectiveness of tocilizumab or the other drugs or substances you use. Certain drugs, including oral contraceptives and cholesterol lowering drugs, are metabolized or broken down by liver enzymes such as the CYP450 enzymes before the drugs are eliminated from the body. By decreasing inflammation, tocilizumab increases the activity of the CYP450 enzymes, which leads to a faster break down of these drugs. So these drugs are eliminated from the body faster and thus are less effective. Patients who are taking tocilizumab in conjunction with drugs like oral contraceptives and cholesterol lowering drugs should exercise caution as the drugs' effectiveness may be decreased. The effect of tocilizumab on the activity of the CYP450 enzymes, and therefore on the effectiveness of the drugs metabolized by these enzymes, can last for several weeks after stopping treatment. Avoid live vaccines if you take tocilizumab. Researchers haven’t evaluated how safe and effective live vaccines are with the drug. Patients should be up-to-date on vaccines before starting treatment. Let your doctor know if you are scheduled to receive a live vaccine such as the shingles vaccine, the chickenpox vaccine or the MMR vaccine. Other FDA-approved rheumatoid arthritis medications include Humira and Enbrel. The labels for these medications warn of serious side effects that are not included in the label for Actemra. This has led many patients and doctors to see tocilizumab as a safer choice. But studies and reports to the FDA have revealed the three drugs carry similar risks. In fact, a 2017 STAT investigation showed the risk of certain side effects is as high or higher with Actemra compared to other rheumatoid arthritis medications. The drugs are similarly effective in treating rheumatoid arthritis. They treat other conditions as well.